Meet this week’s Fashion Icon of the Week: Symone Phillips! 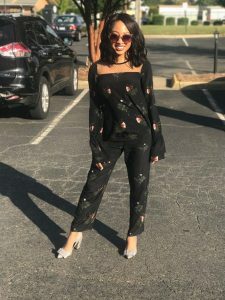 This week, we’re shining the Fashion Spotlight on Symone Phillips, a Marketing and Management major with Music Business and Entertainment Industries minors. This stylish junior is a recent lover of the minimalistic lifestyle; simplicity is her motto. Denim is definitely a staple to achieving a minimal yet stylish ensemble, and Symone agrees. “I have about four jean jackets. They’re barely even different colors! But jean jackets just go with everything!,” said Phillips. She loves them because they can be worn to dress down dressy outfits or paired “with an already casual outfit” to complete the look. Either way, “it still looks bomb.com!” said Phillips. Aside from planning her outfits, she also blesses the world with her style and fun personality on YouTube. Check out her channel to watch her vlogs and hear about her fashion and beauty tips. And you even get a chance to look at her adorable puppy, Sophey!